Built 1730-1740, the convent of Las Capuchinas occupied a street near the center of Antigua. This plan clearly shows a rectangular convent organized around a central courtyard. To the north stands a circle of small, trapezoidal cells, which were probably living quarters for novices. The plan shows, at left, the single-aisled church of the convent, its entrance marked with an "a", The nuns would have heard mass from a small chapel within their cloister, listening and looking through a grille opening onto the church. It appears at the top of the plan, adjacent to the church, its axis running perpendicular to the nave. The letter "b" marks the entry into the convent. Near to it, there would have been a place for the nuns to speak with visitors through a grille in the wall. The large open space at center is the central cloister of the complex, an architectural feature common in convents across Spanish America and Europe. Opening onto the cloister was the convent’s refectory, or dining room, and behind it stood the kitchen. This circular two-storied structure to the northeast, had small cells, perhaps for novices. The convent, like so many structures in Antigua, was abandoned after the major earthquake of 1773. It was home to nuns, then, for only about 40 years. 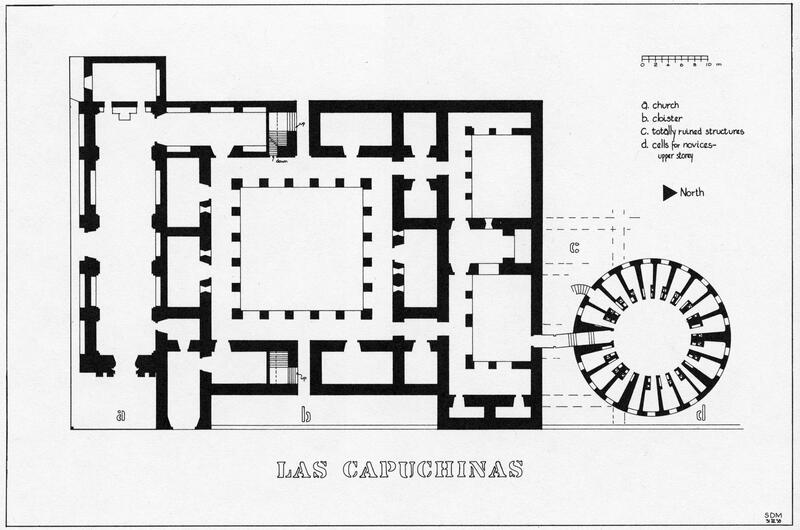 The plan of Las Capuchinas, mixes both traditional elements, like the arcaded central court, along with novel ones, the circular cloister, making it clear innovation in architectural planning was not shunned in Spanish America. In this instance, however, the novel arrangement was not emulated elsewhere, suggesting that local decisions were often influential only in local settings. Annis, Verle Lincoln. 1968. La arquitectura de la Antigua Guatemala, 1543-1773./The Architecture of Antigua, Guatemala, 1543-1773. University of San Carlos of Guatemala. Markman, Sidney David. 1961. 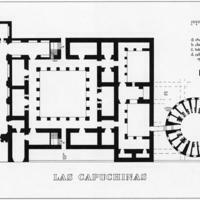 “Las Capuchinas: An Eighteenth-Century Convent in Antigua.” Journal of the Society of Architectural Historians 20: 27-33. Markman, Sidney David. 1966. Colonial Architecture of Antigua Guatemala. Philadelphia: The American Philosophical Society. Mesa, José and Teresa Gisbert. 1963. “El Edificio Circular de Capuchinas en Antigua, Guatemala.” Anales del Instituto de Arte Americano e Investigaciones Estéticas (Buenos Aires) 16: 13-27.